Dimmable LED Lamps offer a life of 50,000 hours. PAR30 produces 500 lumens and replaces 65-watt BR30 or 50-watt PAR30 halogen bulbs. 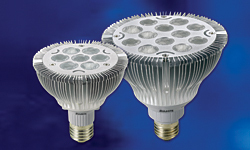 PAR38 produces 743 lumens and replaces 100-watt BR40 or 75-watt Halogen PAR-38 bulbs. The lamps use seven and 12 LEDs, respectively. Each LED consumes two watts.